Isaac N. Young, son of Davis Young and Elizabeth Pinson, husband of Lucretia Abernathy. Mr. Isaac M. Young, a good and well known citizen, passed away at his home on the Felton place, three miles from the city, last Friday after a week’s illness of pneumonia. 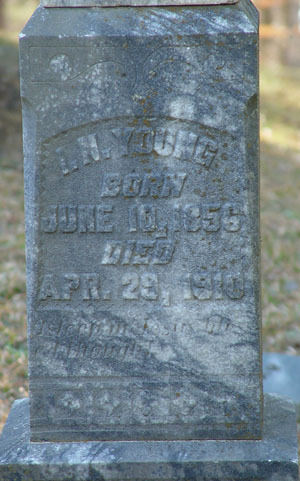 Mr. Young was forty-nine years old and was born and reared I this county. He married Miss Lula Abernathy, a daughter of Rev. 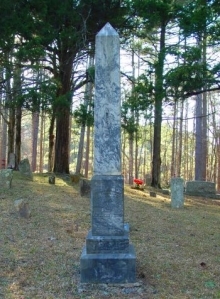 Bard L. Abernathy, of Stamp Creek, and moved to Cherokee county shortly after his marriage and lived there up to about six years ago, when he decided to return to his native county, moving to the Felton place and engaging in farming. He was a hard and energetic worker and left his family in splendid shape, having accumulated some property and money during his life time. He was a brother of Rev. Allen Young, of this city. He is survived by his wife and thirteen children. The funeral services were conducted Sunday morning at Macedonia by Rev. Sheffield, the Baptist minister, of Kingston, and interment took place at the Macedonia cemetery. A large crowd of friends and relatives from all over north Georgia came to attend the funeral. He was a kind good-hearted gentleman and made many friends during his life, who sympathize with the grief-stricken family in their sad bereavement.